My watch is dying. It looks ok on the outside but it’s internal organs have gone to a purchaser of body parts. The organisation that was Pebble is no more - sold to Fitbit for chump-change. Going too, are all the online services that kept the Pebble watch functioning day to day. It’ll keep working through 2017 we are told, but I have my doubts: Three times this week my usually ultra-reliable Pebble has restarted itself, once losing data. Undoubtedly symptoms of a more serious and terminal disease. I’m sad. 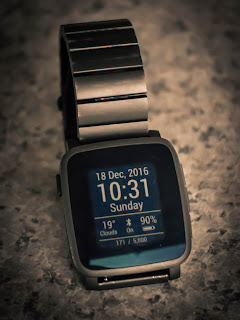 This was my second Pebble watch and I, like many others, thought that Pebble were one of the few companies that got the balance between form, function and price, just about right. Most observers seem to be blaming the ‘lacklustre smartwatch market’ but, that sounds like blaming someone (anyone) else for your own failure. At the end of the day, Pebble were simply underfunded, over expensed or a bit of both. No doubt the legendary optimism of engineers had a part to play; by their own admission, the Pebble Time took twice as long to develop as they originally thought. Technical product development might be exciting, but bringing a product to market is never an easy road. So, around 2 million Pebble watches are now on life-support. Life with a Pebble watch will just get more and more difficult as 2017 rolls on. So, what do I do next for a smartwatch? Time is running out … tic, tic, tic.